Red Mango will have 13 locations islandwide after the new restaurant in Old San Juan opens next week. 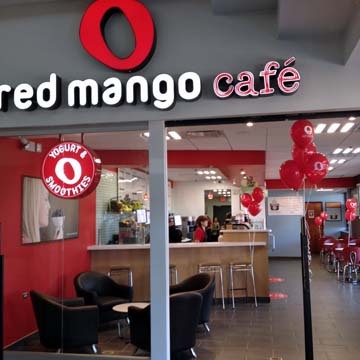 Restaurant chain Red Mango is moving forward with its growth plans in Puerto Rico, with the opening of its 13th location in Old San Juan on May 22, the company announced Wednesday. The new restaurant at Plaza de Armas in the Old City entailed a $300,000 investment and will create 14 direct jobs, franchisor José Rodríguez-Díaz said. “The Red Mango franchise represents an excellent investment opportunity on the island. Its rapid growth in such a short time was the main reason to bet on it,” said Rodríguez, who was accompanied by Mario Alverio-Domínguez, CEO of Good For You Franchise, LLC, the firm responsible for the growth of Red Mango in Puerto Rico. “Over the past three years we have constantly renewed our menu, incorporating local flavors and products, and new easy-to-eat healthy options,” added Alverio. The menu includes its vegan juices squeezed and packaged upon request, assorted salads, wraps, flatbreads, local coffee, yogurt, 21 different flavors of fruit shakes smoothies and breakfasts, lunches and dinners with pre-calculated calories. Hey Buddy!, I found this information for you: "Red Mango opens 13th restaurant in Old San Juan". Here is the website link: https://newsismybusiness.com/mango-opens-restaurant/. Thank you.